“Thoughts and prayers without action are meaningless,” says Gays Against Guns. LGBT groups are calling for additional gun control in response to Sunday night’s mass shooting in Las Vegas, which saw 58 killed and more than 500 injured at a Jason Aldean concert at the Mandalay Bay resort. “After Newtown, our nation called for action,” said a statement released by Human Rights Campaign president Chad Griffin. “After Tucson, Virginia Tech, Aurora, San Bernardino, Charleston, and Alexandria, we called for action. After the shooting at Pulse Nightclub a little more than a year ago, we called for action. Yet, in the face of these mounting tragedies, many of our lawmakers have refused to act on meaningful gun safety legislation. 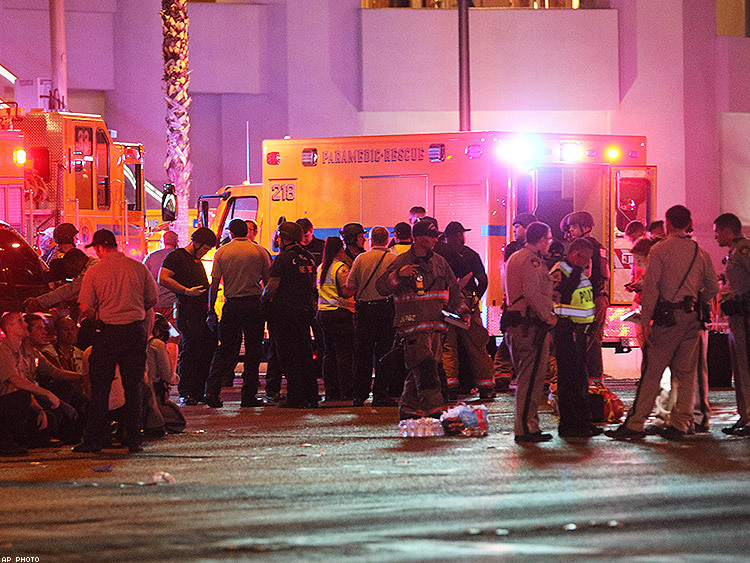 As these politicians fail to act, at least 58 people in Las Vegas were killed last night, while hundreds more have been injured. It’s time for Congress and the White House to act. We need leadership now, and we must continue to demand it until our lawmakers either hear us — or we have new lawmakers." Measures endorsed by HRC include banning access to assault-style rifles, expanding background checks, and limiting the ability for suspected terrorists and those with a history of domestic abuse to access guns, notes an HRC press release. While little information has been released about the kind of weapon the Vegas shooter used, the scope and lethality of the attack indicate the use of a semiautomatic weapon and possibly even a fully automatic one, both of which qualify as assault rifles. He may even have used cheap, easily available attachments, one called a trigger crank, the other a bump stick, both of which accelerate the firing of a semiautomatic weapon, a gun expert told USA Today. Gays Against Guns, which formed in response to the massacre at the Pulse LGBT nightclub in Orlando last year, issued a call to action. The group has been going to gun shows to talk with participants about the effects of gun violence and confronting politicians who resist further gun restrictions. “Thoughts and prayers without action are meaningless,” the group noted on its website. It will hold a rally tonight from 6 to 8 at Union Square in New York City, and it has a meeting scheduled for 7 p.m. Thursday at the New York LGBT Community Center. The Las Vegas attack now surpasses the Pulse shooting as the deadliest mass shooting in U.S. history.